To ask other readers questions about The Editor, please sign up. Will this make me cry as much as Lily and the Octopus did? Steven Rowley's The Editor really hit the spot for me. It was utterly charming, it had so much heart, and it dealt with some of my favorite subjects—family dysfunction, struggles with self-confidence, writing, secrets, and the relationships that crop up in the most unlikely of places. James Smale has always dreamed of being a writer. After having his first few short stories published, he imagined the path to literary success would be easy. But writing a novel never seemed to come easy 4.5 stars. James Smale has always dreamed of being a writer. After having his first few short stories published, he imagined the path to literary success would be easy. But writing a novel never seemed to come easy, and although he hoped inspiration would hit, he wondered if he was destined to be one of those people whose early promise fizzled out. Living in New York City in the early 1990s, it seemed as if he was more suited to random temp jobs than wearing the mantle of a writer. Then he decided to write about what he knew better than anything—his relationship with his mother, an enigmatic woman whom James believed blamed him for the end of her marriage, since she had to essentially choose between him and his father. He is thrilled when he finds out that a major publisher is interested in publishing his novel. And then he meets the editor who fell in love with his book—Jacqueline Kennedy Onassis. Jackie, or Mrs. Onassis, as she is known in the office, loves the complexity of the relationships in James' novel, and she identifies with the main character since she, too, is a fiercely protective mother. James is utterly blown away that this infamous woman, whose family was always a fascination for his mother, has taken an interest in his writing, and believes this novel is worth being seen by the world. But Jackie believes James hasn't dug as deeply into his characters and their story as she thinks he can, and she pushes him to do so. Little by little their working relationship develops into a friendship of sorts, even as he wonders if someone as complex as Jackie can truly be known by someone like him. The reality of the book is causing serious ripples in his relationship with his mother as well as his relationship with his partner, Daniel. He isn't sure if he can finish it, and then a secret is revealed which makes him wonder if he's telling the right story at all. As everything spirals out of control, James needs to figure out the truth about his relationship with his mother and needs to decide what he wants from his relationship with Daniel, but more than that, he doesn't want to disappoint Jackie. I thought this was a beautifully written book, brimming with poignancy and complexity. James was complex and utterly appealing even when he was doing things that made him unsympathetic, and I couldn't get enough of his story. But Rowley's treatment of Jackie Onassis, meshing the familiar tropes with fascinating depth. I loved the relationship Rowley created between James and Jackie. "I'm struck with profound gratitude that our paths have magically crossed for this brief moment of existence; she is, I see now, the only logical editor this book could have had. My book, my valiant quest to understand my own Arthurian legend with Igraine at the heart, to define my own Camelot, in the tender hands of Guinevere herself. My eyes well with tears even though knights are not supposed to cry." This was a quick, immensely enjoyable read, and I'll think about this book for a while. I actually squealed when I first read the synopsis for this one. I thought it was such a clever idea for a historical fiction book and I was really impressed with the author's ability to think a little outside the box. Instead of having a story revolve around Jackie Kennedy Onassis and her time as First Lady, this book features a writer who receives quite the surprise when he finds out Mrs. Onassis is going to be the editor for his book. Her time working for a publishing house and the last few y I actually squealed when I first read the synopsis for this one. I thought it was such a clever idea for a historical fiction book and I was really impressed with the author's ability to think a little outside the box. Instead of having a story revolve around Jackie Kennedy Onassis and her time as First Lady, this book features a writer who receives quite the surprise when he finds out Mrs. Onassis is going to be the editor for his book. Her time working for a publishing house and the last few years of her life haven't been written about as much as some of the earlier periods of her life so I was excited to read this one. I wouldn't even say I'm a big fan of the Kennedy family, but I do find them fascinating, particularly the women, and find myself reading either historical fiction or non-fiction books about them every once in awhile. Now while this book falls into the historical fiction category it is more fiction than fact based. Essentially the author took a fact about Jackie, in this case she was an editor, and used his imagination to come up with the rest of the story. All in all, I think he did a pretty good job at depicting the former First Lady. I loved how this book took place in the publishing world in the 1990s and really enjoyed that feeling like I was getting an inside look into the process a book goes through before it is published. I was actually surprised at how much depth there was to the story as it wasn't just a simple story about a writer and his extremely famous editor. It takes awhile to head in a meaningful direction but it does eventually explore some interesting subjects including mother-son dynamics. So if the whole writing thing or even Jackie O isn't all that appealing consider checking this one out as you might still find it to be a worthwhile read. The only small criticism I have is I didn't like the plot device that was used during the Thanksgiving dinner. Yes, it set the stage for things to come but I was still disappointed. Basically I wish the author would have come up with something else in order to accomplish everything he wanted to in the rest of the story. This is just a nitpick though as overall I really enjoyed the book. Definitely recommend as a good read. Thank you to First to Read for the opportunity to read an advance digital copy! I was under no obligation to post a review here and all views expressed are my honest opinion. THE EDITOR is written by the same author that wrote LILY AND THE OCTOPUS, which is a book I loved. Imagine that, after pouring your heart into writing a book, a publishing house in NY calls you to have your work polished by an editor, and that editor is no other than Jackie Kennedy-Onassis! I'd be so excited I'd pass away on the spot. The novel follows the relationship between Jackie, the editor, and James, the writer, as they work together. We are exposed to the editing process and the story is THE EDITOR is written by the same author that wrote LILY AND THE OCTOPUS, which is a book I loved. The novel follows the relationship between Jackie, the editor, and James, the writer, as they work together. We are exposed to the editing process and the story is narrated in a witty and humorous tone. I enjoyed it (although not as much as I enjoyed LILY AND THE OCTOPUS, which left me emotionally punched and I'm still trying to recover), and highly recommend it to readers of contemporary and historical fiction. How would you react if you show up at a meeting with a publisher, and find out to your surprise that the editor is none other than Jackie Kennedy Onassis? This is the situation James Smale finds himself in when the book opens. It seems Jackie has fallen in love with his autobiographical novel based on his dysfunctional family, and she and James will work together to edit his book. What a terrific premise and the wit and humor only added to my enjoyment. But the more I got into the book the more b How would you react if you show up at a meeting with a publisher, and find out to your surprise that the editor is none other than Jackie Kennedy Onassis? This is the situation James Smale finds himself in when the book opens. It seems Jackie has fallen in love with his autobiographical novel based on his dysfunctional family, and she and James will work together to edit his book. What a terrific premise and the wit and humor only added to my enjoyment. But the more I got into the book the more bored I became. I sped up the audio narration. Despite a bombshell that was dropped at 50% I failed to engage with the characters or the story line. I knew Jackie Kennedy Onassis was an editor at Doubleday but I didn’t like the way the author fictionalized Jackie, who is such an American icon. It felt like a gimmick to shore up a weak plot and I didn’t think it added anything to the story. This was a buddy read with Marialyce, and we were both disappointed. I listened to the audio and if I had not been a captive audience in the car I would have DNF'd. The narrator was good but couldn't carry a lackluster story. It made my long drive feel even longer. Final thoughts: This book had an interesting premise and a strong start that quickly fizzled and employed a gimmick that fell flat. JanB Jayme wrote: "Too bad! I had been on the fence about this one, since I adored Lily and the Octopus, but your review has convinced me to pass! Great re Jayme wrote: "Too bad! I had been on the fence about this one, since I adored Lily and the Octopus, but your review has convinced me to pass! Great review!" JanB Debbie wrote: "This sounds bad! I have trouble with books that fictionalize real people, so I really wouldn't like this one. Thanks for the warning. I Debbie wrote: "This sounds bad! I have trouble with books that fictionalize real people, so I really wouldn't like this one. Thanks for the warning. I'll steer clear! Great review!" OMG, and I’m not a fan of that phrase, but I’m listening to the audio and it is brilliant! Michael Urie fits as tight as “James Smale’s glove” as his character and narrator. Out today! Run to the bookstore, or your computer to order. Read and or listen! As you read this section of the book, you feel exactly as James must feel, as if you’re in a fantasy, a dream-like state. You cannot believe you’re talking to and looking at THE Jackie Kennedy. Let me state here and now, for me she is and will only ever be, Jackie Kennedy. No other names need apply, added or otherwise, regardless of their legality. Time stopped in 1963 for all Americans who were alive and witnessed the Kennedy couple, and don’t even try to bring politics into this conversation. Okay. James is as enamored as you would expect him to be suddenly discovering that ok fine, Mrs. Onassis will be his editor for his first book. Steven Rowley is a talented and clever writer, so he this a serious novel about James’ book, his life, and events surrounding both. However, Steven likes to pepper his writing with smart gems of wit tossed here and there as he did with “Lily and The Octopus” and I adore him for this talent. “I try to smell myself, to see if there is some trace of Jackie’s perfume, or, better yet, some faint whiff of American decorative arts from her White House restoration, leather or oils or fine upholstery. The journey through this book is both marvelous and heartbreaking. James gets to know Jackie well as a friend and their editor-author relationship develops. Jackie is so intelligent and wise, and James is a willing pupil. He does succeed with his published book but that’s not a spoiler, it’s how he gets there with the healed relationship with his mother, his family and his partner that is the real story. Don’t miss one of our time’s most talented author’s second book. Highly recommended. So many hilarious quotes I wanted to add from the smart and witty mind of Steven Rowley. Note: It’s not all just Jackie worship, this is a great story in itself. The sidebar just happens to be Jackie O is his editor. Btw, my opinion only: Michael Urie, your voice is spot on but Jackie’s voice shouldn’t be lower than your’s. 😬 Her’s was breathy but feminine, almost a whisper. Dave Joy I went to the authors reading recently. He has finished his third novel. He sold the movie rights to The Editor to Fox/Disney. Toni Dave, a third novel? Yes!!! Did he say anything about it? And he sold the rights for a movie, very nice. Moving on up. The Editor is an absolute gem from start to finish. Rowley writes beautifully and lyrically, and his depiction of tough familial issues interspersed with the wit and wisdom of Jackie Onassis creates a perfect tale. James Smale is an unpublished author whose autobiographical novel about his dysfunctional has been sold to Doubleday Books. Sent by his agent to the publishing house, Smale is astonished to learn that Jackie Kennedy Onassis is his editor. As they commence working together to prepare t The Editor is an absolute gem from start to finish. Rowley writes beautifully and lyrically, and his depiction of tough familial issues interspersed with the wit and wisdom of Jackie Onassis creates a perfect tale. James Smale is an unpublished author whose autobiographical novel about his dysfunctional has been sold to Doubleday Books. Sent by his agent to the publishing house, Smale is astonished to learn that Jackie Kennedy Onassis is his editor. As they commence working together to prepare the novel for publication, the two develop a friendship of sorts as Jackie strives to help James come to terms with unresolved family issues. Rowley’s inclusion of Jackie Onassis makes the novel spectacular. Her background, intelligence, and sophistication lend a fascinating and unique dimension to The Editor. In addition, Rowley writes with humor and empathy creating a gratifying, funny, and at times heartbreaking tale. Time and again I found myself marking pages where Rowley had written a clever or thought-provoking sentence. This story will stay with me for a long time. A friend and I were discussing literature trends the other day, and as I described the premise of The Editor, we were noting that both this book and The Dinner List include very famous individuals in new settings. Instead of writing historical fiction, Rowley and Searle have created new stories with very well-known women playing significant roles. Both books are magnificent, and I would love to see this trend continue. The Editor is a fabulous book that will certainly remain a favorite of mine. Plans to develop the book into a movie are already underway with Greg Berlanti set to direct, and Rowley adapting the book to a screenplay so make sure to read it before the movie comes out! There are some books that start up out of the gate as gang busters and make you think that this book is one for you. That is how this book began for me. When I got to the fifty percent point, I started to think oh no, this book is sliding downhill but hoped that it would once again be the five star read it was in the beginning. Unfortunately that didn't occur and as I continued to read I became more and more disappointed. The premise of a new author's book being edited by the indomitable Jacqueli There are some books that start up out of the gate as gang busters and make you think that this book is one for you. That is how this book began for me. When I got to the fifty percent point, I started to think oh no, this book is sliding downhill but hoped that it would once again be the five star read it was in the beginning. Unfortunately that didn't occur and as I continued to read I became more and more disappointed. The premise of a new author's book being edited by the indomitable Jacqueline Kennedy Onasis was a draw into the story though of course not the main idea. James Smale, the author, is a man who is initially elated and develops a "relationship" with Mrs Onassis. Then however, as we learn more about James and his tenuous relationship to his mother and his doubts about his unsuspecting boyfriend, I began to see a flawed character. It's not that I don't like flawed characters in my books, but James seemed to me to be a whiny pouting character. True, he faced a revelation that was awful, but he fed into his desperation. He seemed to wallow in sorrow and he became a character I could not help but dislike. Perhaps that is the reason why I found this book to be boring as James continued to be that woe is me person as the story continued. I know there are many of my book friends who found this story to be ever so worthwhile, so please do take look at their reviews when deciding if this story is for you. For me, it was not worth my time and effort and the disappointment I felt seemed to increase with every page. Dana Oh no! So sorry you have had two “duds” in a row! An aspiring gay novelist in 1990s New York lands a publishing deal exploring the estranged relationship between a mother and son, and discovers his Doubleday editor is none other than former First Lady of the United States, Jackie Kennedy Onassis. The Editor was touching, introspective, and full of nuanced emotional character arcs. Right off the bat: this story is not focused on Jackie Kennedy. She is a pivotal character, but her arc in The Editor takes a strong third place to the events of both the protagonist and the protagonist's quest to finish his novel. The Editor has a fantastic sense of time and place—you never forget you're in the 90s. Talk of Clinton's election is prominent throughout and the perception of the homosexual community was present. 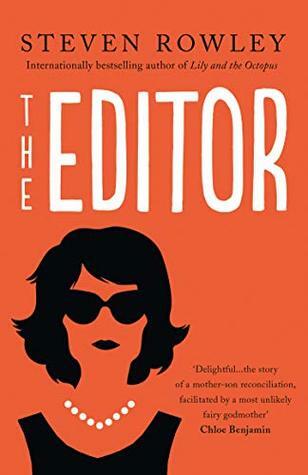 The Editor follows James as he works (under Jackie Kennedy's direction) to find an accurate resolution to his novel, which involves the painful confrontation between the protagonist and his aloof mother. This is an obviously autobiographical work, as James himself has many conflicted issues with his mother and is attempting to repair those bridges indirectly/directly through his novel. The reparation process between James and his mother was fascinating and surprisingly poignant. However, due to the nature of James' constant search for internal reparations and external quest for resolution I found sections of this book to be long winded and entirely focused on James' thoughts and feelings. There were huge paragraphs with no dialogue and minimal action at the start of almost every chapter, lending a sense of odd pacing and making me bored with James. As soon as the dialogue/action resumed in each section, I reengaged. Overall, a great read! Recommended for fans of The Seven Husbands of Evelyn Hugo and others who enjoy intimate and emotional tales. James has written a book about his mother and their relationship. It needs some work according to Jackie, especially the end - she wants it rewritten. As James works on the rewrite he learns some things about his life, his mother, and his father. This book was filled with both humor and introspection. I enjoyed the writing style so it was easy to keep reading as the story unfolded (no pun intended). A great read. James Smale has finished writing his first novel, “Quarantine”, and an editor at Doubleday is interested in publishing it. Until he arrives for his first meeting about the book he doesn’t know that the editor is Jacqueline Kennedy Onassis. James never stops being awed by her aura, history and celebrity. Quarantine is about mothers and sons and Mrs. Onassis is drawn to the book. In her gentle prodding of James to improve the book and make it more true, she also prods him to address issues with hi James Smale has finished writing his first novel, “Quarantine”, and an editor at Doubleday is interested in publishing it. Until he arrives for his first meeting about the book he doesn’t know that the editor is Jacqueline Kennedy Onassis. James never stops being awed by her aura, history and celebrity. Quarantine is about mothers and sons and Mrs. Onassis is drawn to the book. In her gentle prodding of James to improve the book and make it more true, she also prods him to address issues with his own mother Aileen, who is not happy about being a character in Quarantine. I loved the portrayal of Mrs. Onassis, who tried (but often failed) to be treated like any other editor despite her rarified life. She and James have a good working relationship that is not quite a friendship. I also loved the prickly James/Aileen dynamic. The writing was very assured and the story was both funny and touching. After years of trying to make it as a writer in the 1990's New York City, James Smale finally sells his novel to an editor at a major publishing houses, none other than Jacqueline Kennedy Onassis -- or Mrs Onassis as she is known in the office -- has fallen in love with James candidly autobiographical novel, one that exposes his own dysfunctional family. But when the books forthcoming publication threatens to unravel already fragile relationships, both within his family and with his partner, Jam After years of trying to make it as a writer in the 1990's New York City, James Smale finally sells his novel to an editor at a major publishing houses, none other than Jacqueline Kennedy Onassis -- or Mrs Onassis as she is known in the office -- has fallen in love with James candidly autobiographical novel, one that exposes his own dysfunctional family. But when the books forthcoming publication threatens to unravel already fragile relationships, both within his family and with his partner, James finds that he can't bring himself to finish the manuscript. This book made me laugh out loud on several occasions with all the funny moments he writes about. The story is written post JFK and the author makes Jackie's personality jump off the pages. I'm sure many potential authors would do a double take if they walked into their publisher to find that she was Jackie Onassis. This is an entertaining mock memoir of a young author. It's an interesting and original read. A really enjoyable story. Imagine having Jackie Kennedy assigned as the editor of your debut novel, especially for a young male author grappling with maternal issues of his own. This is the premise of Steven Rowley's The Editor. I enjoyed this novel and the way James uses the writing and editing of his novel to discover himself. I will say, I picked up this novel for the Kennedy aspect - which was NOT so much the focus of the book. I think the role of Kennedy could have been played by anyone written as a strong maternal Imagine having Jackie Kennedy assigned as the editor of your debut novel, especially for a young male author grappling with maternal issues of his own. This is the premise of Steven Rowley's The Editor. I enjoyed this novel and the way James uses the writing and editing of his novel to discover himself. I will say, I picked up this novel for the Kennedy aspect - which was NOT so much the focus of the book. I think the role of Kennedy could have been played by anyone written as a strong maternal character to serve the plot, so I was left wanting more on that aspect. I advise you to go into this for James Smale's journey and not Jackie Kennedy's impact and I think literary fiction fans will have nothing but high praise to offer. Lily and the Octopus was a book that I absolutely love, so I knew I would read anything Steven Rowley wrote next but when I read the synopsis for The Editor and found out that the editor in this book was Jackie Kennedy, it absolutely made it to the top of my must-read list of spring books. James Smale is a young, unpublished novelist who is sent by his agent to Doubleday Books to discuss his semi-autobiographical novel with the person who wants to become his editor. No one warned him that the editor just happens to be Jacqueline Kennedy Onassis, the former first lady! The two quickly develop a very unexpected friendship, along with their writer-editor relationship that is a delight and heartwarming! Jackie Kennedy's intelligence, grace, charm, sophistication, as well as her known shyness and demureness are captured perfectly by Rowley with great sensitivity and subtlety and even though she's not the main character in the book, she's such an essential and marvelous part of the story--her wit, wisdom, and gentle (sometimes not so gentle) pushes along the way are certainly the guiding hands for James' character growth in the novel! Just like James, you can't help but be completely enamored by her! The two quickly develop a very unexpected friendship, along with their writer-editor relationship that is a delight and heartwarming! Jackie Kennedy's intelligence, grace, charm, sophistication, as well as her known shyness and demureness are captured perfectly by Rowley with great sensitivity and subtlety and although she's not the main character of the book, she's such an essential and marvelous part of the story--her wit, wisdom, and gentle (sometimes not so gentle) pushes along the way are certainly the guiding hands for James' character growth in the novel! Just like James, you can't help but be completely enamored by her character! Yet, this is James' story no matter how many scenes Jackie may appear. James can't write an ending to his novel that meets with his editor's approval! His publication date is looming fast and at his editor's insistence, his novel needs a completely different ending, but he can't write one until he repairs his relationship with his mother with whom he's at odds because of she never wanted to be the basis of the "mother" character in his novel. The novel is also a coming of age story as James finally discovers who he really is and uncovers some long buried, hard to handle family secrets. More than anything, the story is about the powerful, complex, and all-encompassing love between a mother and son and the journey in discovering what that means for both of them. The characters are so believable that I almost thought they would step off the page, so I can't wait to see the movie adaption of the book of which Rowley is both writing the screenplay and acting as the executive producer! The inclusion of Jackie Kennedy as a literary character just makes it the perfect read, at least for me since she's on my list of famous women whom I most admire, and I'd loved to have met her, just like James. Rowley has written another emotional, thought-provoking beautiful book full of humor and wit that I believe is markedly his own. The Editor is a delightful, heartwarming, at times very heartbreaking, original novel that will remain a favorite. I highly recommend this one! James Smale has finally sold his book to a publisher. When he arrives at the publisher's office in New York, he is shocked to discover the editor who wants to publish his book is none other than former first lady Jacqueline Kennedy Onassis. As he progresses down the road towards publication, James has trouble finishing his story. The book is semi-autobiographical and could cause problems in his already tenuous relationships with his family and partner. He forms an unexpected friendship with Onas James Smale has finally sold his book to a publisher. When he arrives at the publisher's office in New York, he is shocked to discover the editor who wants to publish his book is none other than former first lady Jacqueline Kennedy Onassis. As he progresses down the road towards publication, James has trouble finishing his story. The book is semi-autobiographical and could cause problems in his already tenuous relationships with his family and partner. He forms an unexpected friendship with Onassis, who helps him not only with the ending for his book but with his life. This is the first book by Steven Rowley that I've read. I thoroughly enjoyed this story! I'm definitely going to be reading more by this author! I've had Lily and the Octopus on my bookshelf for quite awhile. I think it's time to move it to the top of the TBR stack and start reading! Rowley tells this story with the sweetest mix of humor, wisdom, and wit. Just a lovely story! I might be generous and make this 2.5 stars, which would then lead me to round up to 3... but nah. I just can't. I raced through this book, not because it was so compelling, but because I was afraid that if I slowed down, I'd just quit. The emotions and relationships just never rang true for me, and this book barely sustained my interest. Marialyce I am just about up to the point where I throw in the towel. It had a lot of promise at the start. Steven Rowley’s The Editor is a jaunty, light read that attempts humor on every page. The opening of the novel, in many ways, reminded me of a duller, less funny version the wide-eyed Andrea Sachs of The Devil Wears Prada but from a male perspective. However, Rowley’s version read more in the vein of puerile than comical, and the jokes and moments of humor never really hit the mark for me. 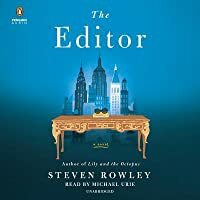 As I read this novel, the attempts at comedy only distracted from the reading experience, because they mana Steven Rowley’s The Editor is a jaunty, light read that attempts humor on every page. The opening of the novel, in many ways, reminded me of a duller, less funny version the wide-eyed Andrea Sachs of The Devil Wears Prada but from a male perspective. However, Rowley’s version read more in the vein of puerile than comical, and the jokes and moments of humor never really hit the mark for me. As I read this novel, the attempts at comedy only distracted from the reading experience, because they managed to take away from the book’s atmosphere rather than add to it. They fell flat and just came off as borderline YA, misplaced in The Editor’s setting. It’s possible that it was my own misunderstanding, but I was hoping for a more substantive read – something with a little more meat on the bones that I could really fall into. It’s possible that I would have responded better to this book if I’d known the type of humor that it was going for – borderline slapstick as the James Smale regales us with stumbling all over himself – and the fluffy way in which the story would be told. *I received a physical copy of this novel from the publisher, G.P. Putnam's Sons in exchange for an honest review. Thanks so much to the publisher! Thanks to the publisher for providing an advance reviewing copy. Novelists often write stories or characters based on their own lives, and I’ve always wondered how that affected the author’s friends and family. What is it like to know that anything you say or do could end up being betrayed—and maybe mischaracterized—in a novel? I was attracted to this novel by the fact that the lead character, James Smale, has written a book about his troubled relationship with his mother, and he has to deal with Thanks to the publisher for providing an advance reviewing copy. Novelists often write stories or characters based on their own lives, and I’ve always wondered how that affected the author’s friends and family. What is it like to know that anything you say or do could end up being betrayed—and maybe mischaracterized—in a novel? I was attracted to this novel by the fact that the lead character, James Smale, has written a book about his troubled relationship with his mother, and he has to deal with his mother about the book. Smale’s agent manages to sell his novel to Doubleday, and first-time-to-be-published James has a “meet cute” with his editor, who turns out to be Jacqueline Kennedy Onassis. Or, I should say, it’s supposed to be cute, but James’s go-to when feeling shock or awkwardness is to say a stream of stupid things. I was not charmed any of the times this happens in the book, nor did I understand why he kept referring to his editor as “Jackie” when he was told over and over—including by her—that he should call her Mrs. Onassis. So I started the book finding the lead character irritating. Mrs. Onassis is intrigued by the theme of the relationship between sons and mothers, but she has many notes for James, feeling that he has unresolved issues that prevent his novel from having an effective ending. So, off James and his boyfriend, Daniel, go to James’s childhood home for Thanksgiving dinner with his mother, siblings and their families. James’s mother has clearly been upset by the idea of this book all along, but she won’t talk to James about it. Then, at the end of the Thanksgiving meal, she drops a bombshell of information about the past that threatens the foundation of the family. Alright, here we go with the big domestic drama. But I just didn’t care about it because I found James and his mother both to be annoying characters. She was passive/aggressive and he was a self-absorbed jerk who jeopardizes his relationship with Daniel because of his selfishness. Characters don’t have to be likable to make a good story, but if they aren’t likable, the story has to be compelling. I just don’t find anything compelling in the story of a person who dwells so much on the past and his feelings about it that he seems to fall into some kind of obsessive love with his emotional wounds. The addition of Mrs. Onassis to this domestic drama felt gimmicky to me until about the final 75 pages. Starting at that point, Rowley finally turns things around and makes her a truer part of the story, achieving some emotional resonance. This took the novel from 2 stars to 3 for me. I suspect a lot of writers have a fantasy about having worked with Jacqueline Onassis as an editor—for probably as many different reasons as there are fantasies. Steven Rowley has written his, with Onassis as an accelerant to the healing of a mother/son relationship. It’s well done and I enjoyed it enough to read 300+ pages in two days. When I take a long time to finish a book because I am reading it between better books, it doesn’t bode too well for my final assessment. Actually, my favorite scene in the book is at the beginning, the first time our hero, James, meets Jacqueline Kennedy Onassis. It’s the early years of the 90s, when she is a Doubleday editor with a small office, who uses a conference room to meet with a client because it has more space. I think Rowley captured her essence there, at least the grace and polish sh When I take a long time to finish a book because I am reading it between better books, it doesn’t bode too well for my final assessment. Actually, my favorite scene in the book is at the beginning, the first time our hero, James, meets Jacqueline Kennedy Onassis. It’s the early years of the 90s, when she is a Doubleday editor with a small office, who uses a conference room to meet with a client because it has more space. I think Rowley captured her essence there, at least the grace and polish she exuded, along with her mild, gentle blend of shy and assertive. The scene was light, delicate, and showed promise. But I never felt true liftoff the rest of the way through the novel. I want to stress that this is purely subjective, and I don’t wish to discourage readers who are eager to read this book. Perhaps your experience will be different. For me, it plodded along with pedestrian fervor. It came off as if Rowley had borrowed a plot from central casting and then placed his characters in it, never actually delivering something new, passionate, and intriguing. The actual arguments that drove a wedge between characters were uninspired and derivative, with a few precious moments of levity, also limp. There was a tendency to over-explain and over-explicate. For example, two characters have a surprise run-in, and one of them needs to justify what he was just doing. This leads to nervous, strained dialogue, unfolding to a parallel conversation. It is evident in the words that they spoke, obvious to the reader, yet the author clumsily inserts, “We’re almost having parallel conversations.” Unnecessary explanation, and it was either condescending to the reader, or the author didn’t trust the reader to get it. The gist of the story is an anguished writer finally is getting his novel published, and his editor is none less than Jackie O. He has to deal with his estranged mother in order to write an organic ending to the story, “The Quarantine” (that title is explained in the first few pages). His relationship with his boyfriend of five years starts to get rocky, and of course his whole life is existentially in the balance. Oh, the thunder and crash of success. The Editor is a fictional novel about first time author James Smale who sells his book to Doubleday during the 1990's only to find out his editor is Jacqueline Kennedy Onassis. The story is very lovely and awkward and funny at times as James tries to feel comfortable with his new editor and not make a complete fool of himself in the process of getting to know her. As Jackie and James do begin to bond, James' other relationships, with his mother and family, whom the book is based, on begin to fall The Editor is a fictional novel about first time author James Smale who sells his book to Doubleday during the 1990's only to find out his editor is Jacqueline Kennedy Onassis. The story is very lovely and awkward and funny at times as James tries to feel comfortable with his new editor and not make a complete fool of himself in the process of getting to know her. As Jackie and James do begin to bond, James' other relationships, with his mother and family, whom the book is based, on begin to fall apart (more than they already had been), as does his long-time relationship with his partner Daniel. Although he looks to Jackie for notes on his book, she seems to sense his anxiety and tries to give him the life advice he so desperately needs to finish his work and perhaps make peace with his life. One of the best chapter sequences is the Thanksgiving Dinner at James' mother's house. Most of us can empathize with the tensions that sometimes erupt, and how deeply hidden secrets can come spewing out! I laughed and gasped and laughed again! The writing is so creatively crafted and although completely fiction, what a testament to Rowley's writing style to make you feel James' relationship with Jackie really took place. I loved the humor, the insight and the sadness he brought into the story. The book is out today. Don't miss it! To write an autobiographical novel entails a great deal of risk. Because people know you are writing about your own life--fictionalized--inevitably bringing emotional turmoil into the lives of those people. And perhaps that is why James Smale can't bring his novel to a satisfying end--he is reluctant to go the distance because of the high costs. Smale's editor believes in him, in his novel, and in the story he has yet to tell. He can't tell it yet, because he hasn't lived it. And his editor pres To write an autobiographical novel entails a great deal of risk. Because people know you are writing about your own life--fictionalized--inevitably bringing emotional turmoil into the lives of those people. And perhaps that is why James Smale can't bring his novel to a satisfying end--he is reluctant to go the distance because of the high costs. Smale's editor believes in him, in his novel, and in the story he has yet to tell. He can't tell it yet, because he hasn't lived it. And his editor presses him to do the work. Oh, Smale's editor at Doubleday is Jaqueline Kennedy Onassis. It makes things very complicated. Does he call her Mrs. Onassis? Jackie? Are they friends or coworkers or is she his boss or does she work for him? Everyone wants a part of her, all his friends are more interested in the minutia of her life than they are in his book. As Smale agonizes over his manuscript and his relationship with his mother and the father who left her "because of" him, his relationship with his beloved Daniel comes under strain. Do they have a love for all time? Everything Smale believed he knew comes crashing down at a family Thanksgiving gathering when his mother shares a secret. The beginning of The Editor revolves around Smale's coming to grips with his discovery and the shock of being discovered by one of the most famous women in the world. As a mother, she is deeply interested in his book. As an editor, she pushes him into uncomfortable territory. And the novel takes a turn from the comic into the universal theme of a child trying to process their childhood and relationships with parents. The search for the mother, in Smale's case, becomes a discovery of the father. Rowley's novel has already been signed to be a movie! I had no idea what to expect going into this. I had no idea Jackie O was an editor! But, I ended up reading a beautiful story of a struggling writer, who finally finds an editor who wants to publish his book. And it turns out to be the very famous woman her self. The story feels like a sneak peek into a writer’s life (I imagine quite like reality! ), and an even sneakier peek into Jackie's life, although it’s just fiction, it feels so real - and you want it to be. The narrator is witty and he’s qu I had no idea what to expect going into this. I had no idea Jackie O was an editor! But, I ended up reading a beautiful story of a struggling writer, who finally finds an editor who wants to publish his book. And it turns out to be the very famous woman her self. The story feels like a sneak peek into a writer’s life (I imagine quite like reality! ), and an even sneakier peek into Jackie's life, although it’s just fiction, it feels so real - and you want it to be. The narrator is witty and he’s quite humorous - I found myself laughing out lot frequently. Steven Rowley really captured me with Lily and the Octopus, and so when I knew he had a new one coming out, I definitely was excited to get my hands on it. But I didn't get any info beforehand, I was just "whatever it is, I want it" mode. So, I picked it up as a galley (thanks to Putnam for sending me a copy), and went into it knowing basically nothing. That means that even though the jacket copy (and even another version of the cover) talks about Jackie O., I was totally excited a I. Loved. This. So, I picked it up as a galley (thanks to Putnam for sending me a copy), and went into it knowing basically nothing. That means that even though the jacket copy (and even another version of the cover) talks about Jackie O., I was totally excited and flabbergasted when she showed up in the story! I spent some time googling her life post-JFK to get some idea on how much this mirrors her story, and I love the way that Rowley brought her to life on the page. Short story: Our main character is James Smale, a debut author who has written a book about his mother (but it's fiction). He walks into a meeting with an editor, wholly unprepared to meet Jackie. WHAT?! Her personality really JUMPS off the page. The story is compelling is interesting. Her history is sprinkled throughout. And Rowley's writing is full of quips, funny moments, and literally makes me laugh out loud on the regular. Although I'm not crying with laughter, the way his scenes play out really remind me of David Sedaris. And that's high praise. What if Jackie Kennedy was your editor? I loved this! A writer that finally gets picked up by Double Day Publishing gets the surprise of his life when he discovers that Jackie Kennedy is his editor. His novel is about his mother, whom he paints in a not so gracious light. Jackie tells him he needs an ending to his novel. She sends back home where he discovers secrets about his mother he never knew before. There are just so many things in this novel that I loved. The characters, his relationship What if Jackie Kennedy was your editor? I loved this! A writer that finally gets picked up by Double Day Publishing gets the surprise of his life when he discovers that Jackie Kennedy is his editor. His novel is about his mother, whom he paints in a not so gracious light. Jackie tells him he needs an ending to his novel. She sends back home where he discovers secrets about his mother he never knew before. There are just so many things in this novel that I loved. The characters, his relationship with Jackie, his relationship with his lover. This was wonderful! I highly recommend this novel. A great book club selection as well. I love that James’ relationship with Jackie Onassis forces him to confront his own mother and the dysfunctional nature of their relationship. Beautifully written and really heartwarming. Besides the fact that this book has an absolutely stunning cover, the premise caught my eye and I was intrigued enough to read it. Jackie O is my favorite first lady. I don’t know a whole lot about her life and history, but I think she is one of the classiest first ladies we have had, she was a Catholic like me, and last but not least, I adore her style. I had no idea that she was an editor at one point in her life, so seeing that in the pitch for this book pretty much sealed the deal for me. The Besides the fact that this book has an absolutely stunning cover, the premise caught my eye and I was intrigued enough to read it. I had no idea that she was an editor at one point in her life, so seeing that in the pitch for this book pretty much sealed the deal for me. The other thing that I thought was really cool about this book pitch was that it included a letter from the author talking about the book. I was really moved by some of the things that he said were important to him in this book—-families, family relationships, mother-son relationships. Having a boy myself, I was even more excited to read this book after reading his letter! One of my favorite things to tell my friends and family is, be careful, I might write you into my novel someday and I may or may not be very nice about it. As an aspiring writer myself, I have often thought about using my own family as a basis for a novel, but then thought better of it because of this exact situation that James faces in this book—how do you deal with the repercussions of putting your mother in a book in a most unflattering light? I found this aspect interesting and very compelling. It often made me think and I loved how introspective James was. I also loved that the focus of the book wasn’t entirely on Jackie O. I mean she was a character in the story and all, but the focus was really about James’ relationship with his own mother which I thought was touching and beautiful. I loved seeing Jackie in a unique setting—in a setting that I would never have pictured her in, in fact—and I loved getting to know her. But the mother/son relationship in this book really shines through. James’ story is relatable and I think lots of readers will see their own quirky family reflected in his autobiography within this story. I think that parental relationships are hard all around. Don’t get me wrong, I love my mother and father, but there are things that drive me insane about them and now that I am a mother I sit in absolute terror wondering at what point my son is going to discover that I have flaws like anyone else and then pick apart my own irritating quirks. So this story resonated with me in a big way all around. I also loved the portrayal of the relationship between James and his partner Daniel and how that relationship was effected by James’ novel and relationship with his mother. Any couple—gay, straight etc—will relate to the struggles that James faces in this book. While I loved a lot of aspects of this book, I did struggle at times with James. I often found him incredibly self absorbed which did wear on my after a while. Ultimately I went with a 4 star rating because of this. I absolutely love the wa I honestly don't know what I expected going into this book, but it certainly wasn't what I got. This is outside of my normal genre but is a prime example of why I love going outside of my usual reads. I absolutely know just about nothing about the Kennedys or Jackie O - I was never that person that was obsessed with them but of course I know the "basics" because I don't live under a rock. And while Jackie is an integral part of this story line, she doesn't steal the show. Steven Rowley is the bestselling author of Lily and the Octopus, which has been published in nineteen languages and is being developed as a major motion picture by Amazon Studios. He has worked as a freelance writer, newspaper columnist and screenwriter. Originally from Portland, Maine, he is a graduate of Emerson College. He currently resides in Los Angeles. His new novel, The Editor (G.P. Putnam' Steven Rowley is the bestselling author of Lily and the Octopus, which has been published in nineteen languages and is being developed as a major motion picture by Amazon Studios. He has worked as a freelance writer, newspaper columnist and screenwriter. Originally from Portland, Maine, he is a graduate of Emerson College. He currently resides in Los Angeles.